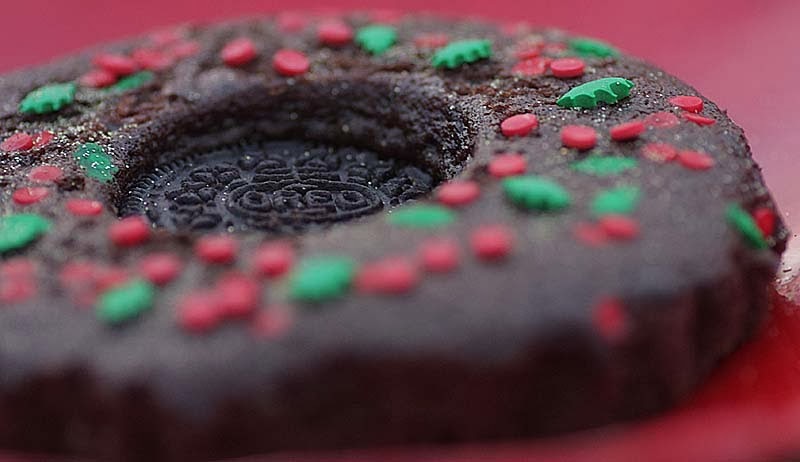 The outer layer is soft and light, and the Oreo biscuit retains not just its bite, but the white coloured cream inside remains moist. And guess what these are vegan too. 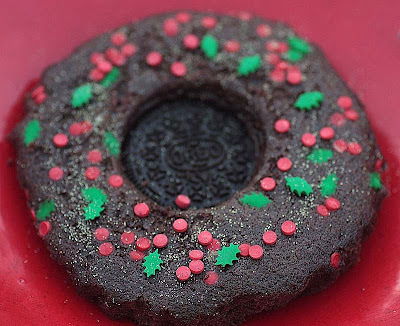 Of course, these Biscuit /CookieWreaths can be made with any round biscuit, but Oreo's are quite popular at the moment with my nephews and nieces. Actually, I've had a request to make some more this weekend, and I can't say no - after all 'tis the season to be merry. Heat the oven to Gas Mark 5. Line 8-10 round cake tins with baking parchment paper. In a large bowl, sift the flour, cocoa, soda, salt and cinnamon. Stir in the sugar. In a small bowl, combine the coffee with the oil and whisk. Then beat the liquid into the dry ingredients. Then quickly stir in the vinegar. Pour the batter into the prepared tins and press a cookie into the centre of the batter. 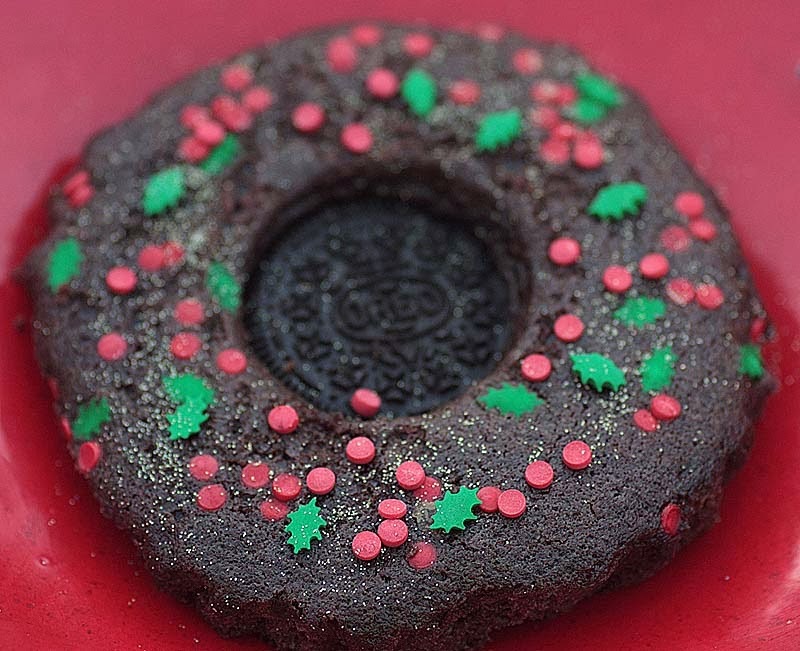 Then carefully and evenly scatter the edible red berry and holly leaf decoration onto the batter, avoiding the Oreo biscuit. Bake for 20 – 25 minutes, or until a toothpick comes out clean. These are better served the following day. Yes, I can see how those would appeal to children of all ages! Oh yes, I can attest that these oreo cakes are truly delicious and have a lovely light texture to them too. Thank you Johanna. As long as the round cake tins are bigger than the oreo cookie for the batter to rise you should be fine, you may make more or you may make less but they will be larger. OH yest a bigger cake would work splendidly too, as this cake recipe was one for a larger cake. What a fabulous recipe! I have to make these, I really do. Thank you Jacqueline. I hope you do and the men in you life like them. Your so welcome, Thank you Sooz. Always great to hear from you. What a fantastic, tasty, seasonal treat! Thanks for taking part in Treat Petite.